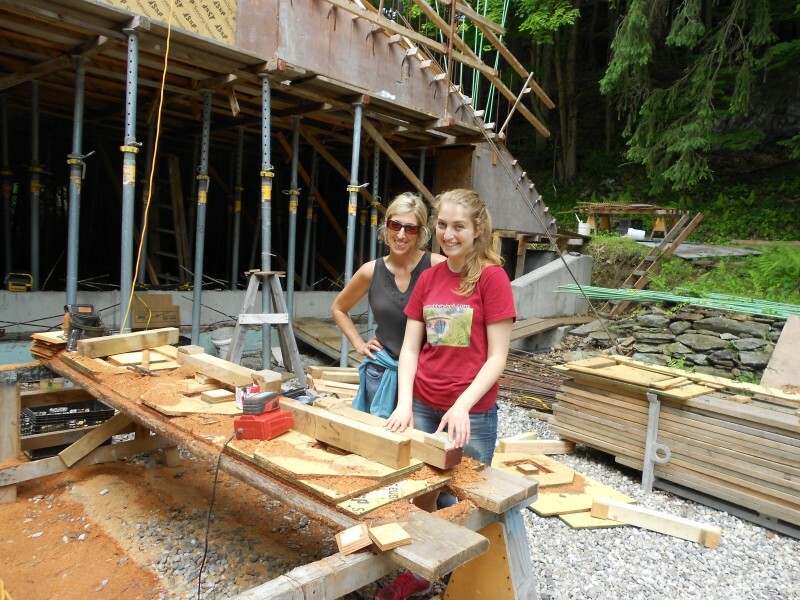 Hello again and welcome back to another addition of the Hobbit Hollow construction blog! Oh yeah, things are moving along now. I was thinking ,just now for some odd reason, of the scene in the Fellowship of the Ring when Gimli the dwarf was complaining about the road to Mordor. ” First an impossible labyrinth of razor sharp rocks! And then it gets even better! Festering stinking marshlands as far as the eye can see!” To which Aragorn replies: ” That is our road. I suggest you take some rest Master dwarf.” Aye, tis a long road building a Hobbit house. At least we won’t have to go through a lot of swampland. But we are getting there week by week, one nail at a time. Or to be a little more accurate for this post one piece of tied rebar at a time. So let’s get to work shall we? Okay, we all know what a thermos does, right? Or to be more accurate what a water cooler does. Well, I have this 5 gallon water cooler at home that I used to use when I was a Little League baseball coach. So on game day and at practices I would fill it up with cool water and throw a bag of ice into it so the team would have a nice cool drink on a hot day. I mean this thing would keep the water cold for days. It’s what we use at work too. I mean sometimes if I forgot to empty it out after a baseball practice the ice would still be inside the next day. That’s how good this thing works. (I forgot to mention this last week so I’m just backing up a bit. ) Anyway, it was going to be hot last Saturday so I was leaving early and I told Terence to get the water jug and fill it with water and ice for the day. Okay? Okay got it Dad. So we’re working away last Saturday and Terence goes to get a drink of water and he says, ” This water is warm.” I’m like “What? That’s impossible you just filled it up! You did put ice in it didn’t you?” Yep. He opens up the top and then says ” And the ice is all gone.” Now I’m trying to work and I’m not really concerned with the water situation because it wasn’t really that hot out. So I tell Jude to just go to Quick Stop and throw another bag of ice in there will ya. Terence being the family know it all comes back with “The ice is just going to melt. There’s something wrong with that water jug. You’re going to have to get a new one!” To which I reply “Jude- just go get the damn ice like I said!” Kids. They always think the solution is in Daddy opening up his wallet! So. Where were we? Ah yes starting the rebar. Wow! I can’t believe it! We really are starting to see some progress now. What? Rebar? You don’t know what I mean when I say rebar? Just a quick refresher. 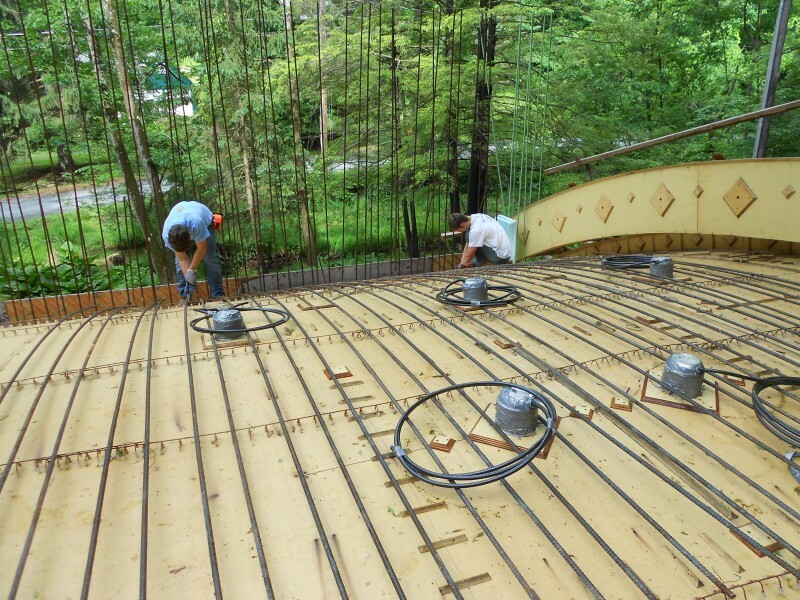 Rebar is a what we call the steel reinforcement bars that are going to be one of the main structural components of our Hobbit House. 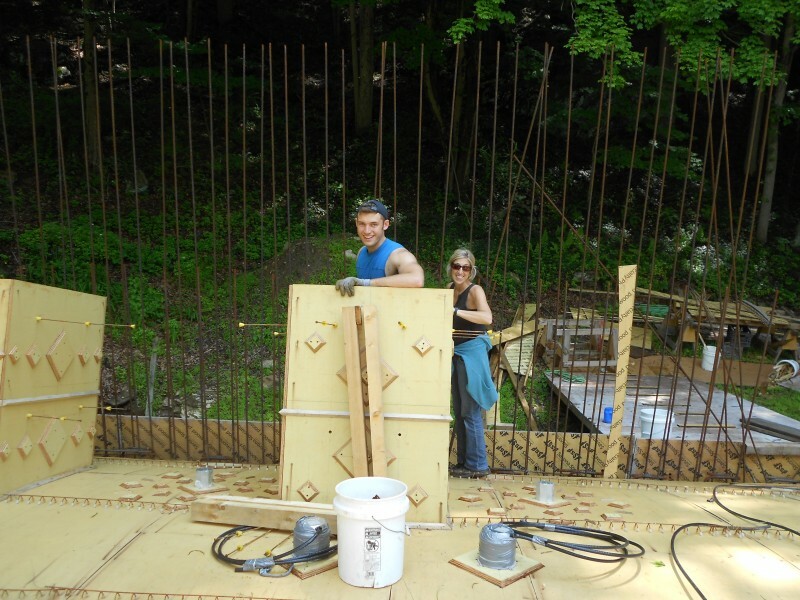 I don’t know if you remember but in one of my earlier posts I spoke of what rebar does in a reinforced concrete structure. 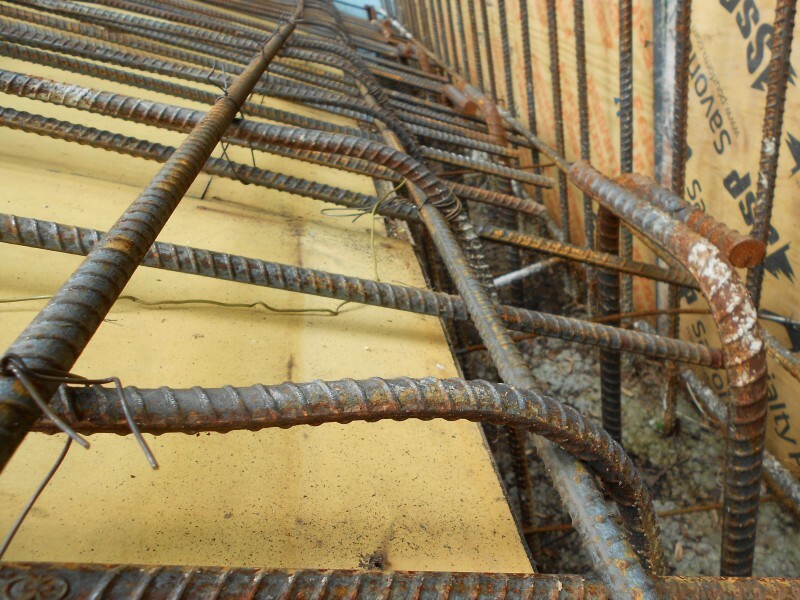 Just the short version: The rebar takes all of the tension load in the structure. So the engineer who designed the structure figured out where the structure will bend and that is where we will be putting most of our rebar. That’s an oversimplification but you get the gist of it. So my thinking during the week was get a couple of wire lathers up from the city and have them tie the steel while I organize the crew with where everything has to go. I was thinking if I had 3 to 4 lathers up here we could probably get the whole thing done in a day. That would be pretty sweet. Tying steel is tricky but these professional lather guys make it look simple. But things happen for a reason. It is Father’s Day weekend and the guys I wanted to come up had to work at their job sites in Manhattan. So nobody was going to be able to make it. Which actually turned out to be a good thing believe it or not. I wasn’t ready. We still had high hats to put in and I wanted to get the skylight and curb walers done as well. I also wasn’t 100% sure how the rebar was going to stay down on the deck as well. If that turns out to be a problem it will be a frustrating day for all of us. 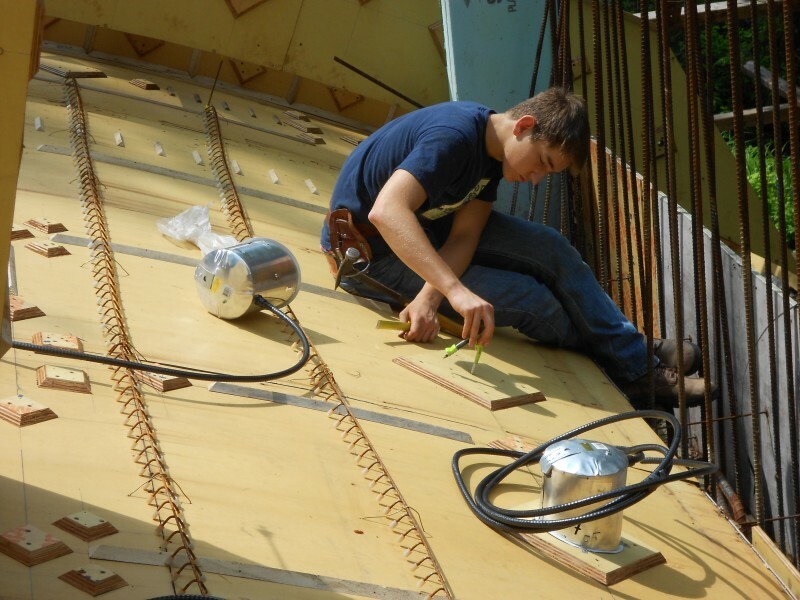 Another thing that has to be done is after the bottom mat of steel is tied we have to install all the wiring through the ceiling for all the high hats and any additional wiring that we need to do…and that’s not going to be quick either. So I had Jude ask one of his friends to work with us because Ethan had to leave for his summer job at 11AM. This way we could have partners working together. We started at 9. I didn’t want to-I wanted to start at 8 but this editor is brutal. Editor’s quote: “That’s too early!” In a sense it worked out well though. I got to eat my blueberry pancake. Man, was that good. I love blueberry pancakes! It’s the little things that help you get by though. I’m digressing. Let’s get down to it shall we? So Jude’s friend Zack pulled up just before me and he helped me get set up for the day. I then outfitted him in lather gear. Tie wire reel, tie wire and lineman pliers. Soon everyone else was there and I got everyone going. I outfitted Ethan the same as Zack and I set them up to start the bottom mat of rebar. Luckily Ethan and his friend Marco tied off all of the bottom chairs to the deck during the week so that critical portion of the job was all good to go. It’s critical that the chairs are secured to the deck so we can tie the steel in place. Especially on a sloping deck. You can’t have the chairs going all over the place. So what Ethan and Marco did was key. 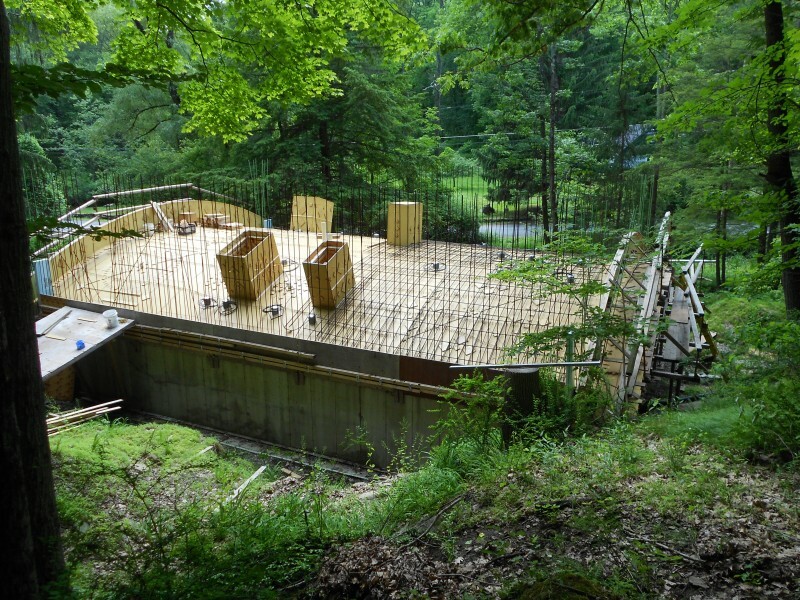 One of the things I wasn’t to sure of was how easy or difficult it would be to pass up all of this rebar onto the deck. Turns out my fears were unfounded. One man down on the ground leans up one piece of rebar and the man up top pulls it up. 1-2-3 done. We would set up about 20 pieces at a time. So that was no problem. When we first started putting the first way bottoms down I noticed that the tail end over the wall was coming up way high. In other words it was trying to stay straight and wouldn’t take the shape of the curved roof. I set up Ethan to tie down another row of chairs but then came up with a better solution. Tie a horizontal runner to the verticals coming out of the top of the wall and slip the first way steel underneath that bar. This actually helped on two levels. It helped keep the bottom mat tight to the deck and also established the bending location for the verticals to get bent into the slab. Verticals get bent into the slab you say? A picture’s a thousand words. Check it out. So the vertical rebar that we had coming out of the top of the wall all has to get bent into the slab. The first row of rebar I had the boys bend into the first way mat. The second set of verticals which are a lot longer will eventually get bent into the top mat of rebar. How is this done? Hmmm. What we use is a rebar bending tool that we call a hickey. In this application we took the vertical by hand and bent the top part of the bar down to the mat. Once it was there we stepped on it and tied the top to one of the first way bottoms. Then we took said hickey and bent the rebar properly into the slab so it wouldn’t lift up. 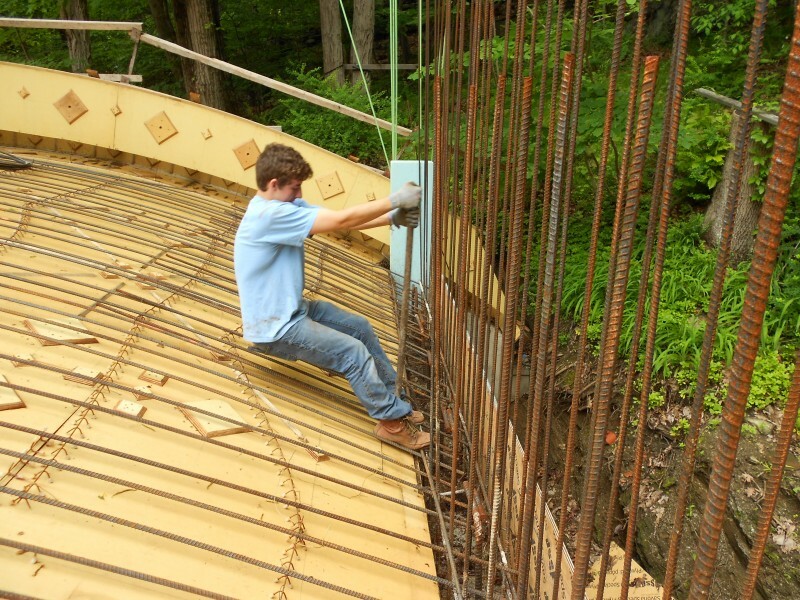 Here’s Zack using the hickey to bend the rebar properly. Soon thereafter we began the cross. The cross is the second way bottoms which run at 90 degrees to the first way forming a large grid or mat of rebar. First way bottoms were #5’s at six inches on center the second way is #5’s at 18 inches on center.Get it now? Got it. Good. Who needs these lathers from New York? I showed these guys how to tie and they did a pretty good job for first timers. Here are Ethan and Zack installing the bottom mat. Just a few other things we had going on on Saturday. Terence took care of the balance of the high hats. These were for the most part the angled ones I showed you last week. They are a pain in the neck to install but he did a good job. Check it out. Terence installing hi hats ahead of the rebar. You can see in this picture how we held the slab chairs in place. Two holes drilled through the deck and then tie wire tied underneath the plywood deck. I had Georgia and Jude work on the walers for the skylights. There’s a reason I want the snap ties on now which hopefully we’ll get to next week.They had a few setbacks and it was difficult putting the bottom waler on. Here they are. Editor was set up to screw in the detail blocks. Gotta get her out of my hair. I put her alone for a reason. She’s like a fly in the ointment if you will. Always dragging someone down with her. And never liking what’s playing on the music box. (There was more than one argument about what was playing, believe me when I tell you. I mean I had to have an outside consultant put his opinion in just to see if we had to change the channel. Poor Zack. He didn’t realize what he was getting into today.) I had the editor take the lunch order early just to get rid of her. Editor screwing in detail blocks. I don’t know who’s worse: Her or Bob the neighbor.At least she’s cute. Later on I had the editor and Georgia set up and make the walers for the retaining wall curb. Here they are. Well it’s Father’s Day and I hope all you Father’s out there can relax a bit and enjoy your family.For all those Father’s who are no longer with us they should know that they are missed and that we are thinking about them on this day. I know I miss mine. I’m going to stop here and enjoy the rest of the day with my family. It’s a wonderful life! First way bottoms about halfway done. Oh yeah, and Terence swears he didn’t put hot water in the water jug. All that ice just melted on its own somehow. Wow, coming along nicely! Poor Terence. Hey Mike good to hear from you. Yeah our own John Kelly. Could you believe that one? When you mention that name for some reason I remember him slam dancing with his girlfriend. Thank goodness that craze didn’t last. I hope all is going well. This editor is really staring to irritate me though. Just kidding. Take it easy and I hope to hear from you soon!